Angela Radford Lewis was recently named ACE Fellow of the Year by the American Council on Education. At ETSU, Lewis is the associate vice provost for undergraduate programs, curricula and service. “It’s an awesome opportunity that very few people have, and I am very grateful I was selected,” Lewis said. The ACE Fellows Program is built to ensure that leaders in higher education are ready to face real-world challenges and serve the needs of their institutions. Only 33 fellows were selected this year from the pool of applicants. This distinguished program teaches fellows years of on-the-job experience and skills development within a single year. Lewis holds bachelor of science degrees in home economics and vocational home economics education from Middle Tennessee State University. She received her doctorate degree in human ecology from the University of Tennessee in 2003. She has been employed by ETSU since 2004. 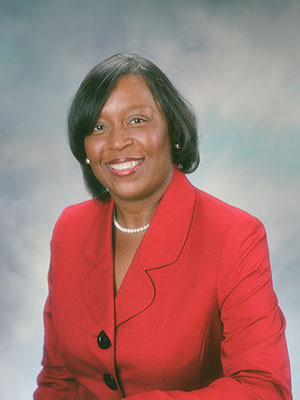 She was first chair of the department of family and consumer sciences and in 2009 became associate dean of the college of education. Lewis has an extensive background in education. Before coming to ETSU, she was an educator in Mississippi and Alabama for six years. She worked as an education consultant for two years for the Tennessee Department of Education and was employed by Middle Tennessee State University in the department of human sciences from 1998-2004. Lewis is looking forward to enriching her background in education even more with the program. “I am extremely excited about expanding my leadership capacity and the opportunity to work with and learn from outstanding leaders in higher education,” she said. Lewis received the 2015 Distinguished Service Award from the American Association of Family and Consumer Sciences and is a member of Kappa Omicron Nu National Honor Society, National Coalition for Black Development in Family and Consumer Sciences, Phi Kappa Phi, Association of Career and Technical Education and the Tennessee Association of Family and Consumer Sciences. She is also a very active member of the Johnson City community and hopes to continue to benefit ETSU.